How do you go about educating kids about being healthy? Do you talk about it often during a visit? Do you have a routine or formula that you follow? Is there a certain way that you talk about nutrition with kids? Parents often find it really difficult to get kids to eat their vegetables, or encourage them to drink more water. 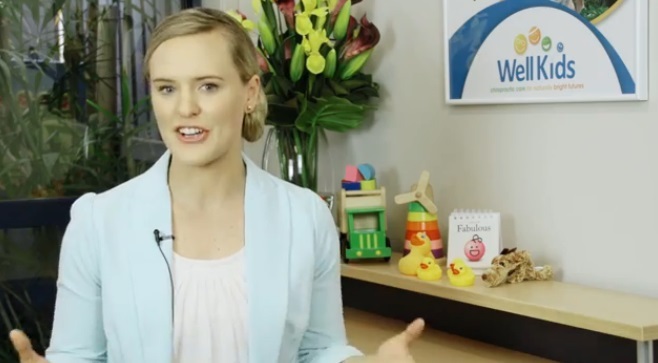 In this video I go through the role chiropractors can play in supporting parents to get their kids into a healthy eating habit. It doesn’t matter how often a mum or dad can ask their child to drink more water or eat all their veggies, it just doesn’t sink in as well as when someone else tells them! I see this time and time again with families in practice – usually with the primary school kids. It can be a big deal for some families, and it can often be a big struggle at the dinner table! As a chiropractor interested in wellness, I believe we play a role and need to be part of the solution. Parents need our help, guidance and support to support get their kids eating more vegies & drinking more water. I love when I have a new child begins care, it’s the perfect opportunity to establish myself as someone who is fun, who is educational and really cares for the child. We have such a unique position to support families, because we get to see families frequently. I start educating kids from day one. I am upfront of my expectations, and I talk to them directly about their ‘jobs’ at home. I can tell you that from the initial console, parents look at me with those eyes saying ‘Thank you’. Thank you for helping me here, thank you for being on my side, thank you for encouraging my kids to be healthy. It’s in those moments I can tell by the look on their face, that they have had this fight with the kids over and over and over. Finish your dinner; eat your vegetables and meat. It’s the same routine over and over. Our role is to help parents & encourage kids. But I think we need to change the conversation around. Lets remove the fight and encourage healthy eating with the things that they love. One of the ways that I encourage children in practice is by linking the activities and things that they do for their health to their favourite sports, afternoon activities; things that they like to do like art and crafts. So the routine begins – After the initial consult I usually know what kind of things they like to do on the weekend, so when I finish up its time to make a deal with the kids. We even shake on it. At this stage I’ve explained about their messages from their body to their brain and how my job is to turn their switches on, their job is to do all the things at home that help their body keep those switches on for longer. I have them very engaged in this activity and we go through the routine and it goes something like this. And when your body is working better, what can you do in a much better way? Play sport, read better, concentrate, kick a ball harder, run faster. Now this is repeated over and over every time they come in. I make sure that I change it up slightly, ask questions from different ages, ask for specifics of what they have eaten and when. I find this really keeps them on track. I’ll often write down challenges – like trying capsicum this week or drinking one whole bottle of water each day. I reward them with high fives or if they have done everything I have asked their name goes on the board as the super Well Kids of the week. Taking the time to educate kids about nutrition is very rewarding for all involved. Taking on some of that responsibility will only take 20 sec conversation each time they come in. Until next week, I’m Dr Jacey Pryjma from Well Kids with the Advice Chiropractors Need When Working With Kids’ See you then.